Product #15818 | SKU Z-QTH | 0.0 (no ratings yet) Thanks for your rating! Please note: This is a pre-order item, stock is due in mid-late March. The QR Tapped Handle is a quick release handle that will work with any Z-Rail to give you a top handle with two ? 16 screw hole mounts. The screw holes can accept a ¼ 20 using a brass collet. The top handle itself is hand tooled fine three quarter maple. The QR Tapped Handle is compatible with our 3” Z-Rail, 5” Z-Rail, Z-Rail Zotshoe, Z-Rail T, and the Zacuto Half Cage. These mounts can be purchased separately depending on your needs. 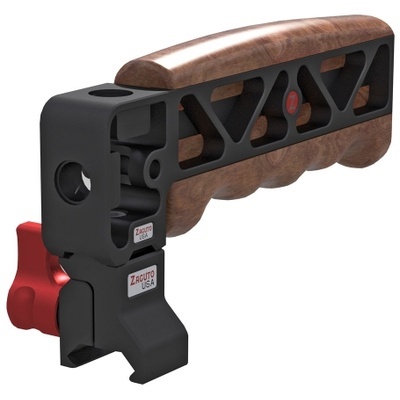 The Zacuto QR Handles are also compatible with NATO, SWAT, RED, PICATINNY, and WOODEN CAMERA rails.